Maybe you feel sad that you didn't go to Burning Man this year. No worries. You can still have your mind blown with art. 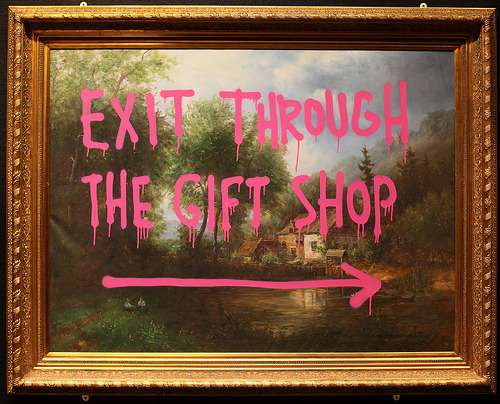 Exit Through The Gift Shop is one of the most provocative films about art ever made. It is a fascinating study of low-level criminality, comradeship, and incompetence. Exit Through the Gift Shop is the inside story of street art--a brutal and revealing account of what happens when fame, money and vandalism collide. The movie follows an eccentric shop-keeper turned amateur film-maker as he attempts to capture many of the world's most infamous vandals on camera, only to have the British stencil artist, Banksy, turn the camcorder back on its owner. Santa Cruz Guerilla Drive-In is excited to partner with the Felix Kulpa Gallery and Streetlight Records. We have two more shows with them. Save the date: Que Viva la Lucha will be on September 27, and Let the Right One In will be on October 25 (the last Friday of the month).